For 10 days at the start of each semester, Williams-Mystic students, faculty, and staff sail aboard a traditionally rigged tall ship. The Offshore Field Seminar enhances our curriculum on land by exposing students to the experience of being at sea. You’ll live out of sight of land, discovering a new way of learning and a new way of life. No matter your level of sailing experience, the Offshore Field Seminar offers the excitement and challenge of life at sea and allows you to learn about the literature, history, policy and science of the ocean firsthand. We work with professional crew members to sail the tall ship we charter, which is designed for teaching and registered with the United States Coast Guard as Sailing School Vessel (SSV). As a member of the crew and under the direction of a mate you to steer, navigate, handle sails and operate the ship around the clock. Williams-Mystic faculty members lead academic classes daily, while the captain and professional crew instruct students in seamanship. You’ll join the ranks of the seafarers you study in history while feeling the sensations that inspired the authors you read in literature. You’ll tow nets to collect biological data in near and offshore waters and use advanced scientific instruments to collect chemical and physical data of the surrounding seawater. As a result, you’ll walk away with a new point of view on law and policies governing trade, commercial fishing, and other exploitations of the world’s waterways. 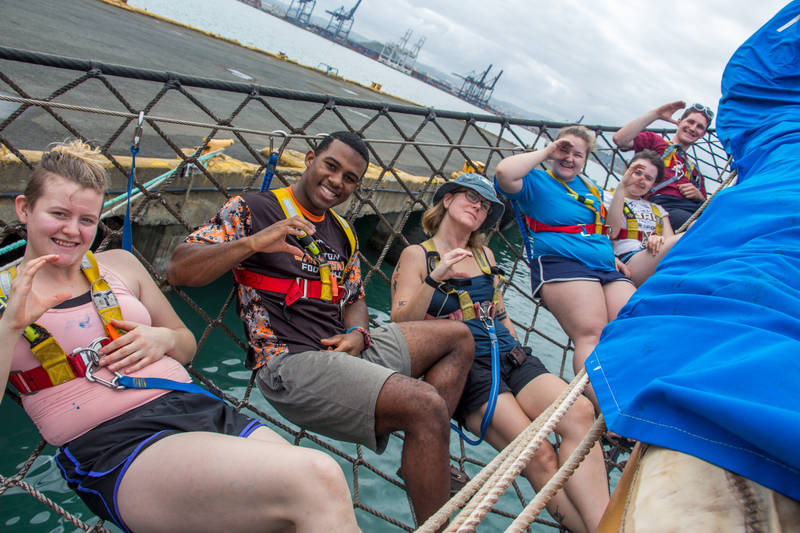 The fall semester voyage departs from a number of different coastal communities. In recent years, destinations have included Georges Bank, the Gulf of Maine, Lake Erie, and coastal New England. The spring semester voyage traditionally takes place in February in the warm waters of the Caribbean Sea. Here we may explore the origins of the Gulf Stream, sample the Puerto Rico trench, or make landfall on a small island fringed by coral reefs.